A hammer toe is also known as a claw toe deformity, and is caused by changes in strength of the small muscles in the foot, worsened by tight fitting and high heel shoes. 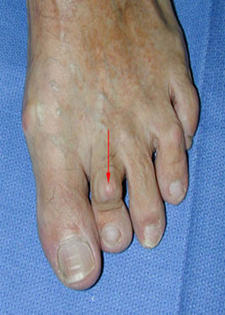 The development of a bunion may also lead to a hammer toe deformity. The non-operative treatment is to wear a slightly wider and roomier shoe, and use soft pads to prevent rubbing on the top of the toe under the shoe. If non-operative measures fail to alleviate the problem then surgery can be considered. Surgical correction of the deformity is usually a day case procedure and is performed under a local anaesthetic ankle block with intravenous sedation. The surgery involves removal of the prominent knuckle of the toe, rebalancing of the tendons of the toe and the placement of a wire down the middle of the toe to hold the position of correction. The wire is simply removed in the clinic usually 4 weeks following surgery. If present an associated bunion will also usually need to be corrected at the same time. 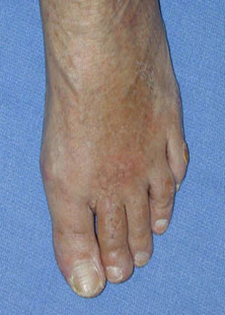 Pre–operative photograph of a patient with a hammer second toe. The patient complained of painful rubbing of the shoe over the top of the bent knuckle joint of the toe (see arrow). 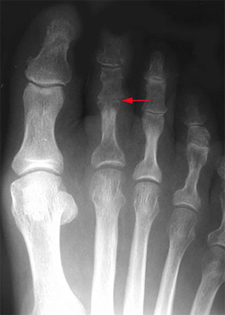 Pre-operative x-ray of the same foot demonstrating the bent joint of the second toe (see arrow). Post-operative photograph six weeks following surgery. The toe is now straight. Note that the toe is slightly swollen, which commonly occurs and may persist for up to 6 to 12 months following surgery. Post-operative x-ray. 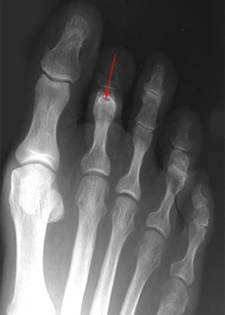 Note that the joint in the middle of the second toe has been straightened by fusing the previously bent joint (see arrow).